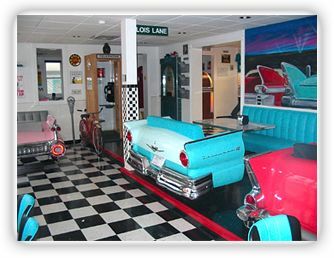 The Fabulous 50's come to life while you dine in an original car booth, watch vintage television, hear great music from our Rockola Juke Box, play pinball and video games or just reminisce with our antiques and enjoy the 50's atmosphere. Take a trip down Memory Lane to the good old days. Put on your Poodle Skirt and Saddle Shoes, Comb your DA and join us for the time of your life! We Double Dog Dare You! 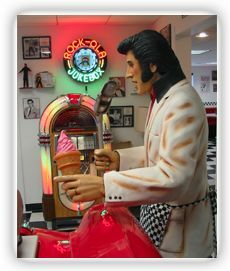 Cool Scoops takes you Back to the Future in it's State of the Art, 50's Style Ice Cream Parlor. Relive those Happy Days and see the Doo-Wop Era. Come to life in our Chrome filled, Black and White tiled, Neon lit dining areas. Enjoy over 30 flavors of Hand-Dipped, Soft Serve and Sugar-Free Ice Creams. Cool off to our current favorites like Slushies and Smoothies Or reminisce over a 50's style shake or malt. 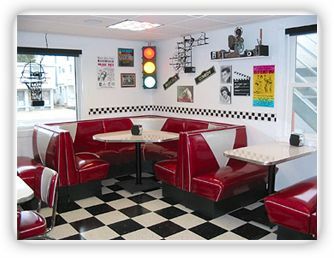 Try one of our specialty sundaes like "ScoopDeVille" or "Lil'Deuce Scoops" while sitting in an original '59 Caddy, '57 Chevy Bel Air or a '57 Ford Fairlane car booth. Put a quarter in the Juke Box, play a game in our Arcade or just relax and watch your favorite oldies on our Vintage Television. 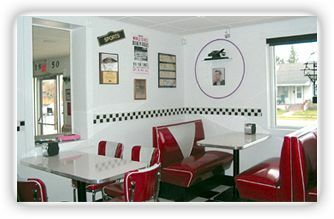 Our original "Hot Dogs in a Hot Rod" snack specials and delicious creamy dessert specialties are the Cats Meow! Forget the future and relive the past! Here's the Scoop...Don't go to "Squaresville" Join us in "Coolsville"
Revised: January 18, 2005 .